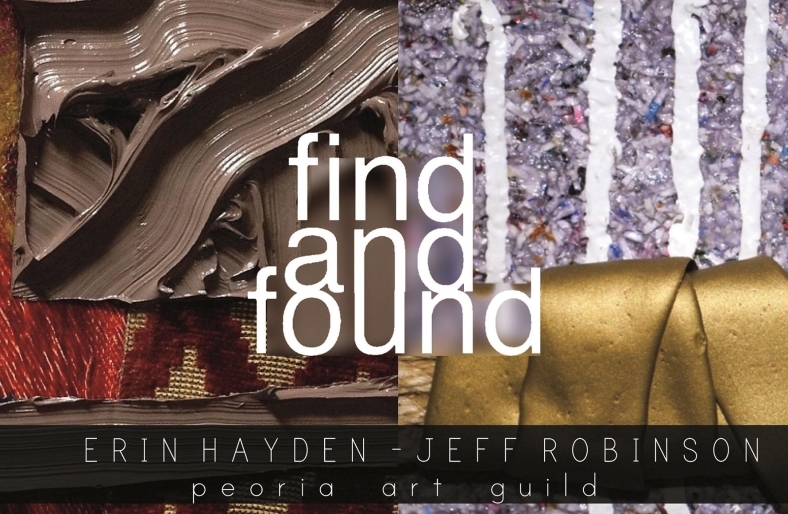 Artists Erin Hayden (MFA candidate, Northwestern University) and Jeff Robinson (Gallery Director, University of Illinois Springfield) offer a free display of mixed media paintings from August 30 to September 17, 2014 at the Peoria Art Guild. An opening reception will be held on Saturday, May 10 from 6-8pm. Erin Hayden’s paintings walk the line between representation and object. By using paint, papers, and fabrics, Hayden conforms to traditional painting and design conventions, while also questioning the legitimacy of pictorial representation and “the phenomenon of simply looking.” Jeff Robinson’s paintings are almost more like constructions than paintings, mashing together materials and found objects to create new and meaningful connections between previously unconnected items. Working within 2 and 3 dimensions, Robinson’s paintings serve as visual allegories for life’s experiences - seeking meaning where none seemed to exist before. Beverages and light snacks to be served on August 30 from 6 to 8 pm at the Peoria Art Guild located on 203 Harrison Street. Parking is available and convenient.